Jyotsna is an applied econometrician with a doctorate in economics from the University of California San Diego, where her advisor was Nobel Laureate (Late) Sir Clive W. Granger. 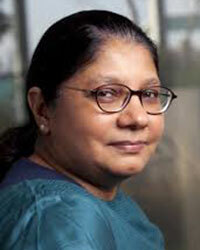 She has written several research papers on poverty, education, health etc. and on estimating the economic impacts of developmental programs. My areas of interest are in the methodological aspects of modern evaluation techniques of economic interventions as well as in its applications. Her paper (co-authored with Martin Ravallion) on evaluating a government sponsored public works program in Argentina was among the first applications of modern impact evaluation methods to programs in developing countries. Currently Jyotsna is working on a joint research project with Dr. Karla Hoff of the World Bank in evaluating a participatory theatre program that attempts to change social norms like patriarchy. The research uses survey questionnaires, vignettes, as well as psychological tests like Implicit Association Tests (IATs) to evaluate the program.